The City of Tallahassee and Art Alley have received a matching grant that equals $50,000 from the National Fish & Wildlife Foundation (Urban Redevelopment) and Wells Fargo to renovate and upgrade the major north – south alley off Gaines Street. The city will contribute an equal in-kind amount or more to include lighting, drainage, and facilities for art works to be displayed. 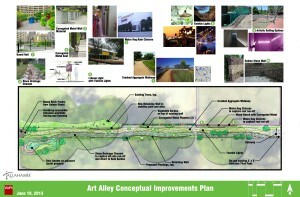 The architectural landscape firm, Wood & Partners, has contributed time and expertise to a conceptual plan for the Art Alley that includes a rain garden.